Another forgettable month for new car sales in Slovakia: down a very harsh 31% year-on-year in September (there is one month delay for this country) to 5,084 registrations, which brings the year-to-date total to 47,080 units, down 13% on 2012. After 4 consecutive months in second position, the Skoda Octavia III finally takes the lead of the models ranking thanks to a very robust 377 sales and 7.4%. 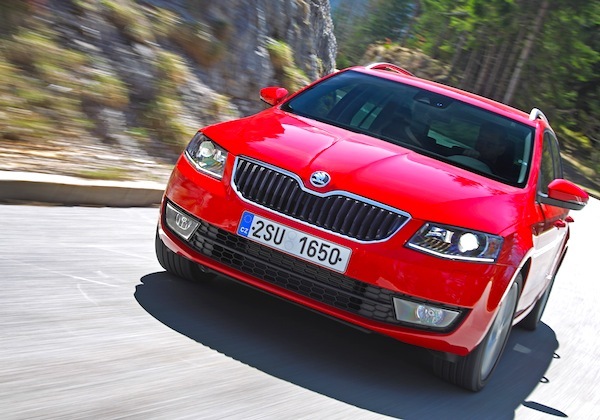 With this performance, the two generations of Octavia add up to more than the Fabia year-to-date (2,881 vs. 2,852), so the Octavia nameplate could technically be considered the most popular in the country so far this year. Skoda trusts all steps of the podium like in the year-to-date ranking but for the first time since last May with the Fabia back up 4 spots on August to #2 and the Rapid up 3 to #3. The Kia Cee’d is down one rank to #4 and 3.4% share but still ahead of its year-to-date level of #5 and 3%, while the Kia Sportage is up one further spot to #6 which is the ranking it held over the Full Year 2012. Notice also the excellent performances of the Skoda Yeti up 18 ranks to #7, VW Polo up 6 to #8, VW Passat up 11 to #9 and Peugeot 208 up 7 to #12. Previous month: Slovakia August 2013: VW Golf surprise leader! Full September 2013 Top 25 models Ranking Table below. Slovakia February 2014: VW Golf ahead of 3 Skodas! previous post: Slovakia August 2013: VW Golf surprise leader!